An eye-catching birthday announcement may go a long way toward getting a good crowd at your party or serve as a way to show your loved ones you're thinking of them. Ditch those dull, store-bought invitations and create something fun. 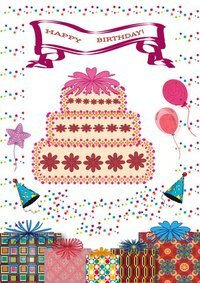 Whether you’re announcing the birthday of your child, family member, friend or self, design the invitation with love. Or perhaps no party will be involved and you'd simply like to acknowledge the birth of someone special to you. Consider one of several options for a birthday announcement. If the party will have a theme, create an invitation related to the theme. Decorate the announcement in similar colors as the decorations. Maybe you’re holding the party at an upscale restaurant. Design the birthday announcement using font the same as the restaurant logo. Use similar coloring to the restaurant décor. If you’re holding a "Sesame Street"-themed party for your young child, make the announcement in the shape of his favorite character. Impress In Print, an invitation and stationary business, suggests that when holding a child’s party, be sure to include her age on the invitation. This helps the guests in choosing age-appropriate toys. Those with lots of spare time who want to invite guests in a way they’ll not soon forget should consider an in-person birthday announcement. With this type of announcement, visit the homes of all your party guests where you’ll announce the birthday. Don’t just show up and say it’s someone’s birthday. Make a creative presentation. If you’re good with words, create a rhyme or poem to recite. Can you write music? Sing or play a song. Arrive in a costume related to the theme of the party. It’s important to include a paper invitation as well, just so the guest will have all of the details. There’s nothing that says your birthday announcement has to be in the form of a paper invitation. Send guests a special item with the details included. Do you enjoy crafts? Purchase some small wooden boxes, which are commonly found in craft stores. Decorate the outside using decoupage, paint or whatever creative way you can find. Design a small, written invitation to go in the box and send to potential party guests. Now they’ll have a useful or decorative item as well. If your artistic child is having a party, have her decorate a T-shirt for each child to go along with the invitation. Other ideas of objects to send are decorated mugs, homemade baked goods or candy. To show a friend or relative how much you care or to commemorate the birthday of your child, consider announcing their birthday on a social networking site. Websites such as MySpace, Facebook and Twitter allow users to post status updates that are then seen by others on a person's friend list. Write a special message as your update and it's sure to hold meaning to the one you compose it for. It's likely to touch others on your friends list as well, when they see your love and gratitude for another expressed in this manner. Newspapers and newsletters may all be possible ways of announcing a birthday. Perhaps you live in a community that publishes a newsletter which is distributed to residents. Or maybe your place of employment publishes one for employees. Consider these as avenues for a birthday announcement. Community newspapers often have sections for announcements. Placing one in a special section, or in the classified section if one is not available, can be a simple but kind way to show a loved one you're thinking of them on their birthday. These types of announcements usually include a short blurb about the person and their life and possibly an address to send cards.